We are coming up on the final weeks of the semester, and looking back, I am immensely proud of all the progress we’ve made. The students have developed a much stronger grasp of the English language, and it is not only apparent in their classwork but in their overall confidence as well. In Reading, we delved into a story called “The Spelling Bee,” which involves a spelling bee champion who makes her classmates feel bad when they lose. After she is asked to participate in a school-wide competition, she has to face higher-level students, and the task proves to be not so easy. “The Spelling Bee” allowed us to have meaningful conversations about why it is important to have empathy, and how the lessons learned in the story changed the main character’s perspective in school. In Science, we learned about matter, magnets, and buoyancy. Some of the work we did included an experiment that combined vinegar (liquid) and baking soda (solid) to make carbon dioxide (gas). Through this, we learned how different types of matter can interact with each other, and, in some cases, create new forms of matter. We also did demonstrations in magnets and buoyancy, testing various objects to see whether or not they were magnetic or buoyant. The students had much fun guessing which objects would float, and being able to test their predictions in real time. In Social Studies, we started a unit on the continents of the world. The goal is for students to be able to gain a deeper understanding of the continents, going beyond being able to identify them on a map and into each territory’s unique cultures, languages, animals, and histories. So far we have covered Australia, Africa, and North America. During our week in Africa, the students made rain sticks, which were believed by some African tribes to bring about rain during dry seasons. In Grammar, students have been introduced to subject and object pronouns, learning which situations it is appropriate to use ‘he’ or ‘him’, for example. 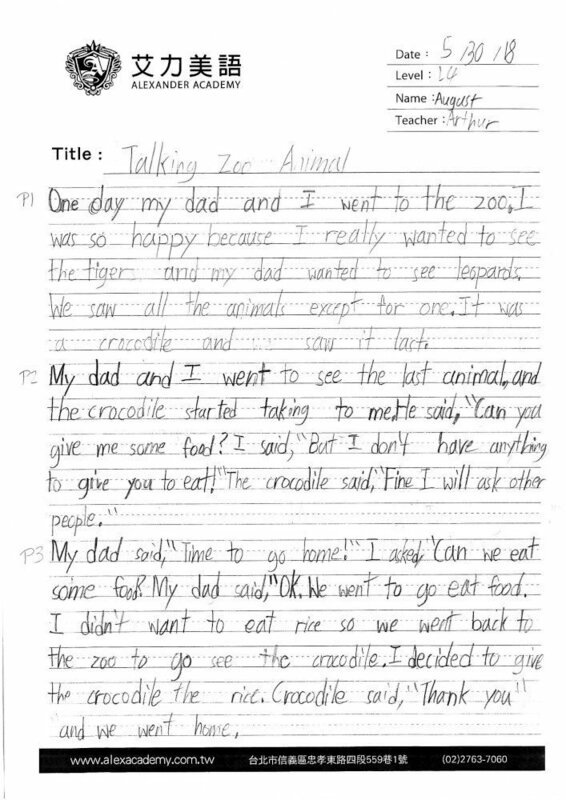 We also spent a few weeks on subject-verb agreement, specifically with ‘is’ vs. ‘are’, and ‘was’ vs. ‘were.’ I have already started to see improvements in students’ writing with these concepts, and it has made them stronger English learners. In Writing, we focused our efforts on a prompt called “Talking Zoo Animal,” where students were asked to write about a time they went to the zoo and happened to stumble upon a talking animal. 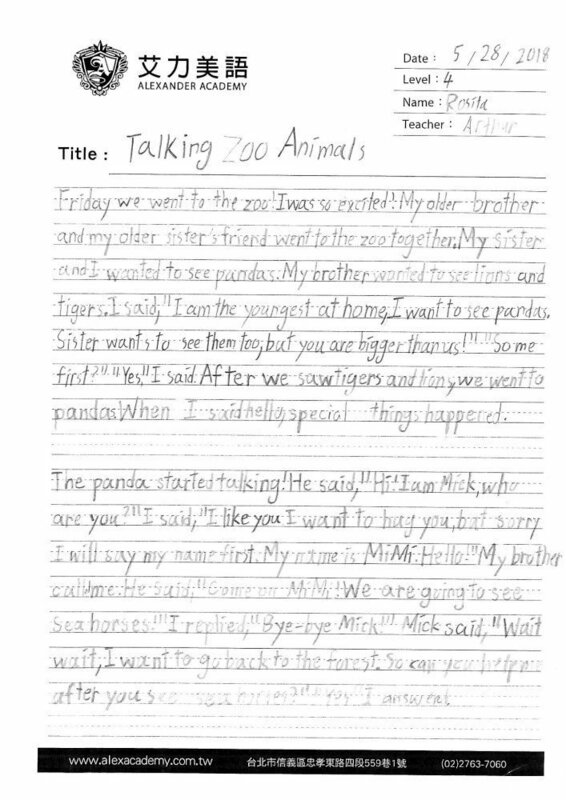 The goal was for them to use their imaginations and put themselves in the place of a particular zoo animal who needs a human’s attention. Overall, the students have been maintaining a positive attitude throughout our classes. They deserve great recognition for their hard work and I look forward to continued success in June.